A map made for a project I'm working on. This project examines the American obsession with the Civil War--as well as the myth of the antebellum Dixie perpetuated in film, television, novels, and other media--and myths about the Confederate States of America through the lens of alternate history. It is a story that examines the existence of two Americas, deeply divided against each other. Here we have the United States ("the North" and "the Union") with its massive industrialized cities choking with smog, poverty, and institutional oppression of immigrants and racial minorities yet also its hopeful looks toward the future with the many people who fight passionately for the rights of women, African-Americans, immigrants, socialists, populists, and more that helped transform the United States into practically two different countries in our own world--and here examined in a way to see what would have happened had that entire beast not been tied to the Jim Crow South. We also have the Confederate States of America ("the South" and "Dixie"), subject of uncountable volumes of real and alternate history, with its repressive and regressive systems based in slavery, racial prejudice, oppression, extreme gaps in wealth, and poverty. It is a land unstable to the point of collapse at any given time and, indeed, in this world by 1900 it is on the edge of a revolution rivaling those in Russia and China in our own world. In real life, the Confederacy was dissolved but its legacy clung on for well over a century and, in many ways, still does to this day. 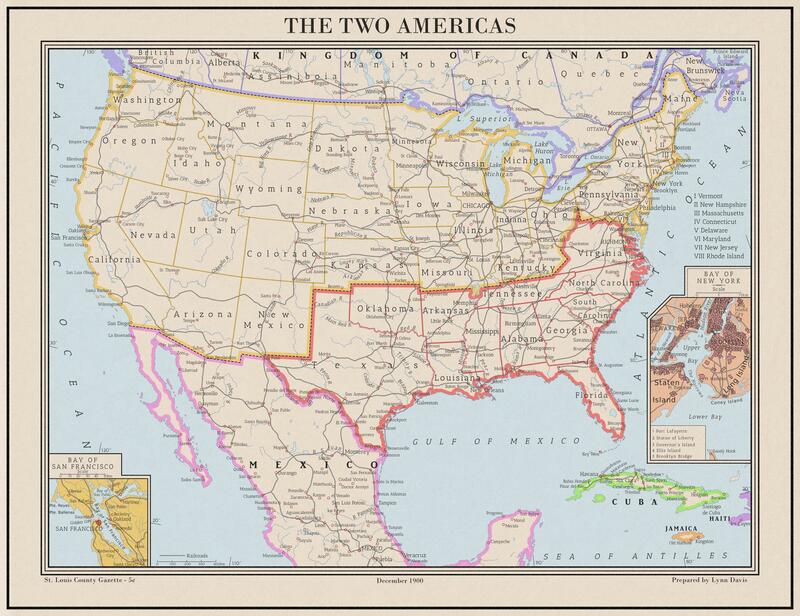 This project, thus, will look at a conceptual view of history in which the two vastly different parts of our own United States take different paths, and what the results would be; and hopefully along the way debunk some of the worst myths surrounding the Confederacy still held today by white supremacists and other evil persons. I hope you enjoy the map and hope you will further enjoy the writing itself, which will accompany this map shortly.